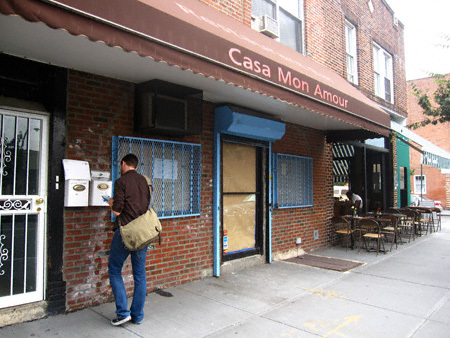 Greenpoint Food Watch: Mexican Comes To Franklin! The one thing I constantly crave but have the damnedest time finding is a honest-to-god, no frills “home style” cheese enchilada. You know the type: red sauce, cheese, lots of onions and little else? Well, I usually schlep to Manhattan for this fare but that may very well become a thing of the past. It’s going to be a Mexican restaurant. 3 Comments on Greenpoint Food Watch: Mexican Comes To Franklin! Oh frabjous day! Now hopefully they’ll know how to make a good, honest, no frills bean burrito (beans, red sauce, cheese, a little onion and nothing else). I swear they’re hard to find here, and even requesting them brings puzzled looks, “you don’t want chopped zucchini and sauteed spinach in that?” NO! No, I do not. Oh and I had a damn fine cheese enchilada at La Nortena (formerly Tacos and More) a couple of weeks ago. Ok well forget it, me and the bf ordered the same stuff from La Nortena tonight and it’s as if we ordered from a completely different (awful) place. We were dumbfounded.